Arthur Ashe Stadium is a tennis stadium at Flushing Meadows-Corona Park in Queens, New York City. Part of the USTA Billie Jean King National Tennis Center, it is the main stadium of the US Open tennis tournament, and the largest tennis stadium in the world, with a capacity of 23,771. 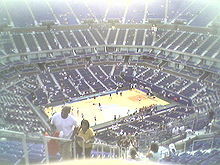 In July 2008, Arthur Ashe Stadium hosted its first professional basketball game played outdoors. Arthur Ashe Stadium, built in 1997 at the USTA National Tennis Center in New York City, is the world's largest tennis-specific stadium. Arthur Ashe Stadium with retractable roof installed, 2018. The stadium is named after Arthur Ashe, winner of the 1968 inaugural US Open, the first in which professionals could compete. The original stadium design, completed in 1997, had not included a roof. After suffering successive years of event delays from inclement weather, a new lightweight retractable roof was completed in 2016. Opened 22 years ago in 1997, the facility replaced Louis Armstrong Stadium as the primary venue for the tournament. It cost $254 million to construct, and then had 15,547 seats, 90 luxury suites, five restaurants, and a two-level players' lounge, making it by far the largest tennis-only venue in the world. Like the other 32 courts in the facility, it has a DecoTurf cushioned acrylic surface. On August 25, 1997, the stadium opened by hosting the US Open, with Whitney Houston singing One Moment in Time during the stadium's inauguration ceremonies and dedicating the performance to the late Arthur Ashe. The stadium has also hosted the first-ever outdoor regular season WNBA game in 2008; the Indiana Fever beat the host New York Liberty 71–55 on July 19. The game served as a fundraising event for breast cancer research. The facility features a Hawk-Eye electronic system which allows tennis players to challenge the umpire's decision on calls made throughout championships. In 2005, the color scheme for the courts was changed from green to electric blue inner courts and a light green outer court. All US Open Series events now use this color scheme, providing television viewers a more easily trackable ball — with the yellow tennis balls contrasting more visibly against the blue courts . Lacking a roof, where relatively strong and unpredictable winds could occur inside the stadium, events were vulnerable to inclement weather — and five straight years of rain delays occurred during the US Open men's singles final from 2008 to 2012. Despite the original design's lacking provisions for a roof, the USTA announced in 2013 plans to construct a roof for the stadium using a 5,000-short-ton (4,536-tonne) superstructure — having consulted "with every architect involved in the design of a stadium roof in North America." Notably, the site of the Ashe center featured poor soil conditions. It had previously been Manhattan's Corona Ash Dumps (featured prominently in F. Scott Fitzgerald's The Great Gatsby as the Valley of Ashes) and prior to that a natural wetland swamp. For the new roof, a very light solution was critical. The roof has two 800-ton fabric panels made of 210,000 square feet (20,000 m2) of lightweight PTFE membrane which can open or close on glides, up to 25 feet per minute, to create an opening roughly the size of 17 Olympic swimming pools. The stadium is not fully conditioned; a new chilled water ventilation system controls humidity when the roof is closed. The new cantilevering design is supported by eight columns that sit on concrete bases, each supported by 20 piles driven 150 to 200 feet deep and has a data acquisition and recording system along with synchronized cameras to interpret the data created by the complex control systems. The roof, which cost $150 million, was part of a $550 million renovation of the National Tennis Center. The retractable roof project was completed in 2016. The roof was designed by Rossetti Architects and its structure engineered by WSP Global. Geiger Engineers performed preliminary design of the roof's mechanization system. Hardesty & Hanover was Engineer of Record for the mechanization system and performed final design. ^ "What's New, and What's Free, at the 2018 U.S. Open". The New York Times. August 20, 2018. The new stadium has the tournament’s second retractable roof, after one was added over the 23,771-seat Arthur Ashe Stadium in 2016. ^ "Ashe & Armstrong Stadiums". United States Tennis Association's official website. Archived from the original on November 16, 2005. Retrieved June 30, 2005. ^ Clifford Krauss (August 22, 1997). "Arthur Ashe Stadium's Opening Serve Is in Giuliani's Court". The New York Times. Retrieved January 26, 2011. ^ Robbins, Liz (July 20, 2008). "Liberty Has Its Moment in History, if Not a Victory". New York Times. Retrieved August 30, 2009. ^ "Blue courts to be used make viewing ball easier". Associated Press. May 16, 2005. Retrieved February 15, 2011. ^ Clarey, Christopher (September 8, 2010). "At Main Court, Wind Is Common Opponent". New York Times. Archived from the original on April 29, 2011. Retrieved September 13, 2010. ^ "U.S. Open: For Fifth Straight Year, Men's Final Pushed to Monday". Sports Media Watch. September 8, 2012. ^ a b "USTA: Retractable Roof Will Be Constructed Over Arthur Ashe Stadium". CBS. ^ a b Meyers, Naila-Jean (August 15, 2013). "Playing Doubles: U.S. Open Will Get 2 Roofs". The New York Times. Retrieved September 5, 2013. ^ a b c d e f g "Arthur Ashe Stadium (USTA)". Taiyo Kogyo Corporation. Retrieved December 28, 2015. ^ "iba-System". iba America, LLC. Retrieved August 3, 2016. ^ Popper, Steve (September 3, 2003). "As Rain Continues, Officials Considering Roof for U.S. Open". New York Times. The New York Times Company. Retrieved August 16, 2013. ^ Berman, Marc (August 25, 2016). "Wait until you see the US Open's new $150M retractable roof". The New York Post. Retrieved August 25, 2016. Wikimedia Commons has media related to Arthur Ashe Stadium.